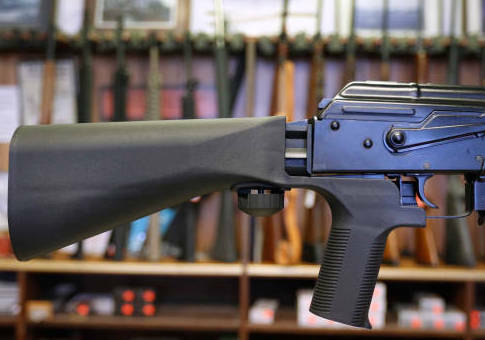 The Bureau of Alcohol, Tobacco, Firearms, and Explosives (ATF) clarified its role in determining bump fire stocks' classification and legality on Friday but wouldn't say whether it planned to revisit the issue. "ATF does not approve items that are submitted for classification," Mary Markos, an ATF public affairs specialist, told the Washington Free Beacon. "ATF provides guidance to the industry and evaluates and classifies items submitted as either being a firearm, an NFA [National Firearms Act] firearm, or not subject to the jurisdiction of ATF." Markos said the classification process at the ATF is initiated when a company voluntarily requests guidance from the agency as to what laws their products may be subject to. From there the ATF examines the product and responds to the company with what laws it has determined the product will be subject to. Depending on that classification the product can be subject to a wide range of laws, including no regulation from ATF at all or a full ban on new sales to civilians. "ATF makes classifications based on the most current laws and regulations at the time of submission and on the results of a physical examination of that specific item," Markos said. "After ATF makes a classification, then the applicable laws and regulations related to the GCA [Gun Control Act] and NFA, if any, apply to the item. Classifications are memorialized via a letter from ATF, which is provided to the requesting individual or entity. These letters are not made public by ATF due to individuals' and/or entities' privacy rights and/or proprietary rights. Classifications are particular to the item submitted for evaluation and do not apply to like items manufactured by a different entity." In 2010, the Slide Fire company requested the ATF review their bump fire stock. The stock is designed to make the bump fire technique, which helps a shooter pull the trigger on a semi-automatic firearm at a faster rate than with traditional shooting techniques, easier to achieve. The agency determined that the company's stock was only a firearm part and not subject to regulation under the Gun Control Act of 1968 or the National Firearms Act of 1934. "The stock has no automatically functioning mechanical parts or springs and performs no automatic mechanical function when installed," the ATF's letter stated. "In order to use the installed device, the shooter must apply constant forward pressure with the non-shooting hand and constant rearward pressure with the shooting hand. Accordingly, we find that the ‘bump-stock' is a firearm part and is not regulated as a firearm under the Gun Control Act or the National Firearms Act." The agency said the classification process is separate from the lawmaking process and only serves to interpret and provide guidance on current law. "ATF does not approve items that are submitted for classification," Markos said. "ATF provides guidance to the industry and evaluates and classifies items submitted as either being a firearm, an NFA firearm, or not subject to the jurisdiction of ATF. Amendments to existing law or the introduction of new laws can have an impact on a previously submitted item that may cause an item’s classification to change. This later change in classification ensures consistency with the most current law. Additionally, if an item previously classified by ATF is changed or altered, this too can result in the item's classification to change." Bump fire stocks have come under scrutiny after it was reported the devices were found on some of the firearms used by the Las Vegas shooter. Politicians from both sides of the aisle have called for the devices to be banned. The National Rifle Association, America's largest gun rights organization, has called on the ATF to review its classification of the devices. "In Las Vegas, reports indicate that certain devices were used to modify the firearms involved. Despite the fact that the Obama administration approved the sale of bump fire stocks on at least two occasions, the National Rifle Association is calling on the Bureau of Alcohol, Tobacco, Firearms, and Explosives (BATFE) to immediately review whether these devices comply with federal law," Wayne LaPierre and Chris Cox, the group's top leadership, said in a statement. "The NRA believes that devices designed to allow semi-automatic rifles to function like fully-automatic rifles should be subject to additional regulations." The ATF has reversed themselves in the past on the classification of similar devices designed to help a shooter achieve a higher rate of fire while using a semi-automatic firearm. The agency first advised the makers of the Akins Accelerator that their device was not subject to machine gun regulations but later reversed themselves and determined the device was subject to those regulations. The ATF did not respond to questions on whether the agency would similarly reconsider its classification of bump fire stocks, however. This entry was posted in Issues and tagged ATF, Gun Control, Las Vegas. Bookmark the permalink.